Cucumber juice is widely used as detox liquid. It not only flushes down the toxins from the body but also helps to lose weight. This simple onion and cucumber salad can give a lot of nutrients along with the freshness of cucumber. You could also try this Delicious Chana Curry! 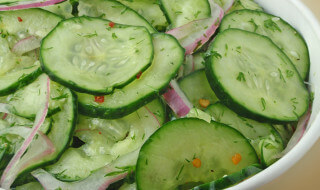 Green Saladhealthy saladOnion and cucumber saladsaladsalad for detoxification.